In nominations announced Wednesday, the 24th Screen Actors Guild Awards heartily endorsed the Frances McDormand-led revenge drama "Three Billboards Outside Ebbing, Missouri," offered swift redemption for the Golden Globes-overlooked romantic comedy "The Big Sick" and left many Oscar favorites empty handed. 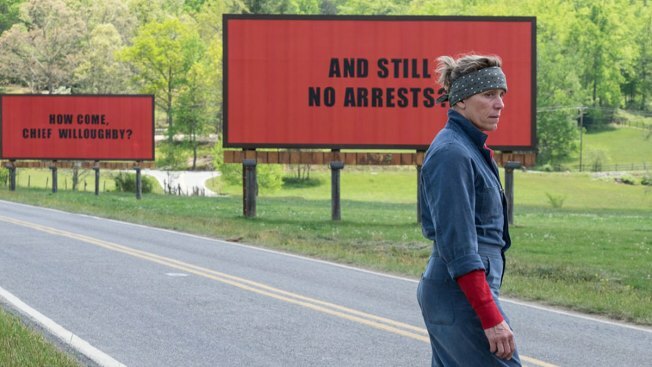 Martin McDonaugh's "Three Billboards" led all films with four nominations, including best ensemble, and acting nods for McDormand, Sam Rockwell and Woody Harrelson. That adds to the movie's strong awards portfolio, including six Golden Globes nods and the often predictive audience award at the Toronto International Film Festival. The other nominees for best ensemble at the 24th annual SAG Awards are: "Lady Bird," ''Get Out," ''Mudbound" and "The Big Sick." As one of the steadiest bellwethers of the Academy Awards, the SAG Awards have considerable sway on the Oscar race. Actors make up the largest branch of the Academy of Motion Pictures Arts and Sciences, though the guild's ranks are much larger. Only about 1,000 of their 160,000 members are in the film academy. The Oscars race so far is considered wide open, and by winnowing the field down to five movies for its top award on Wednesday, the Screen Actors left out many frontrunners. Steven Spielberg's Pentagon Papers drama "The Post" was shut out entirely, including its lauded stars, Meryl Streep and Tom Hanks. After topping the Globes with seven nods Monday, Guillermo del Toro's "The Shape of Water" missed out on the ensemble category, while still landing nods for Sally Hawkins and Richard Jenkins. Critical favorites "Call Me By Your Name" and "The Florida Project" each emerged with a solo acting nomination. Notably passed over was "Call Me By Your Name" co-star Armie Hammer. Instead, Kumail Nanjiani's autobiographical "The Big Sick" followed up its rough Globes morning with not just a best ensemble nod but a supporting actress nomination for Holly Hunter. Along with McDormand and Hawkins, the best actress nominees are: Judi Dench ("Victoria & Abdul"), Saoirse Ronan ("Lady Bird") and Margo Robbie ("I, Tonya"). The best actor nominees are: Timothee Chalamet ("Call Me By Your Name"), James Franco ("The Disaster Artist"), Daniel Kaluuya ("Get Out"), Gary Oldman ("Darkest Hour") and Denzel Washington ("Roman J. Israel, Esq."). Winners will be announced during a January 21 telecast hosted by Kristen Bell.